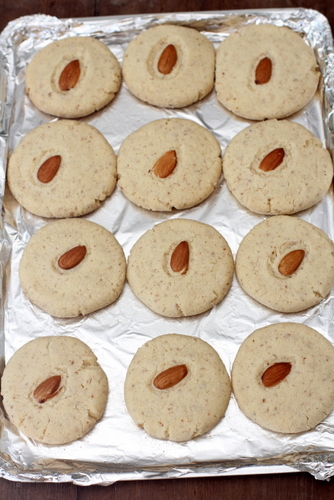 Christmas to me wouldn’t be complete without baking a batch of my favorite rich almond cookies. I always stock on nuts like almonds, walnuts, pistachio and cashew nuts and dried fruits like golden raisins for our family’s daily intake of nuts/dried fruits. All I had to do was reach for the jar of almonds and whip up a batch of cookies to gift this festive season. Let me tell you that they are a breeze to bring together and one of the easy cookie recipes for kids to make this Christmas. 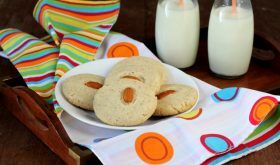 With almond meal being the star player for this eggless cookie recipe, it can be expensive but if you want something rich and special, almond cookies are the way to go. 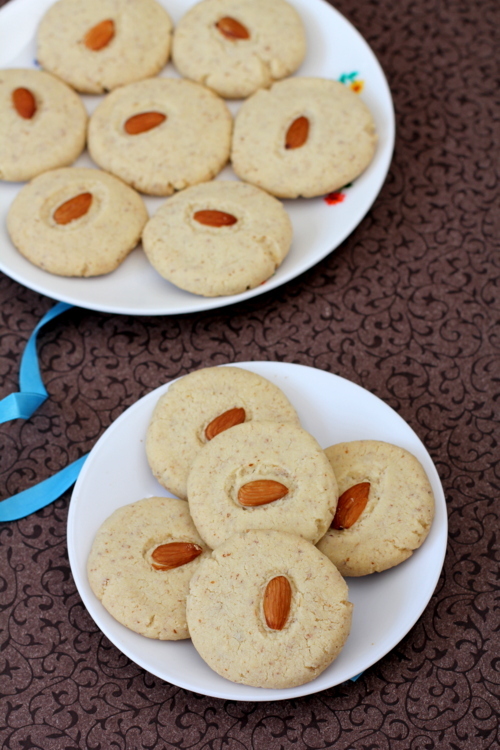 With minimal ingredients going into its making, almond cookies have a slightly crunchy texture with the almond flavor coming through each bite. They are not overly sweet and make for a great gifting idea. All those celebrating Christmas and looking out to bake some goodies for family and friends, do check out more cookie recipes that I have blogged earlier. Sift plain flour, corn flour, baking powder and salt. Set aside. Beat the butter and sugar till light and fluffy. Add almond meal and the sifted flour mixture and make a soft dough. Wrap in plastic wrap and refrigerate for a few minutes. 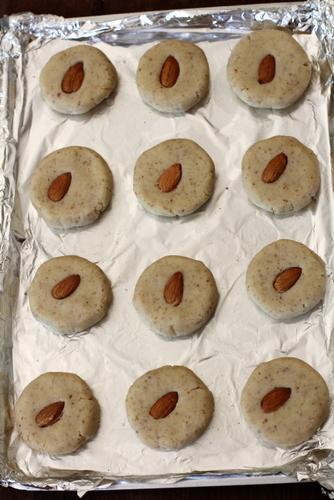 Remove and roll out the dough to 1/2" thickness and use a cookie cutter to cut out the cookies. Place an almond on top of each cut out cookie. Place them on an aluminum foil lined baking sheet and bake in a pre heated oven at 170C for 18 to 20 mts. Check from 15 mts onwards. The underside of the cookie should turn into a light golden brown shade. Remove from oven and place to cool on a wire rack. Once cool, store in air tight container. 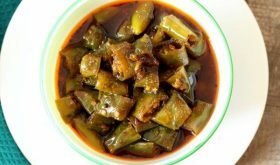 You can also add a pinch of cardamom powder. Grind raw almonds along with the peel to a fine powder. loved your eggless recipes.. thank you for making it so easy to bake..
Do I need to add water to make the dough, or should bind only with butter? No need to add water. Butter will help bind the dough. Plain flour means which flour u used?